True 5G mobile networks and devices won't be here until 2020. That may seem like a long time to you or me, but for the carriers and network equipment makers at Mobile World Congress, it's time to get cracking. There are field trials going on at most major network vendors and operators, and a number of demonstrations in the MWC exhibition halls show how they think the next generation of mobile will work. The mobile industry's been through this before, but this time it's better prepared than ever, according to people who helped define previous generations. This time they have a better grasp of both the demands users will place on the system and the technologies to meet those demands. Applications that consume a lot of data, like streaming video, are already hugely popular and getting more so. Self-driving cars are tooling around the roads of Silicon Valley, while industries are adding more sensors to their equipment. Meanwhile, radios and antennas keep getting more powerful while researchers learn how to use incredibly high frequencies. Some power players, like Nokia CEO Rajeev Suri, think 5G will essentially be done long before it's official in 2020. A few carriers are talking about limited commercial deployments in 2018 or even 2017. But there are some big hurdles to overcome before true 5G is a reality. 5G will be much more than a mobile voice and data system for phones and tablets like 3G or 4G. Virtually everyone here is talking about the same new demands: top speeds 100 times above LTE for video, minimum speeds low enough for years of battery life, shorter delays for machines to respond in real time, connections for more devices, and management software to make one network perform all these stunts at the same time. First, the big numbers: A live demonstration of potential 5G technology by Nokia and South Korean carrier SK Telecom is showing throughput around 20Gbps (bits per second), according to the real-time results monitor in SK's booth. Ericsson pre-standard 5G gear at the show has reached 26Gbps, CEO Hans Vestberg said Monday morning. In T-Mobile's booth, a monitor shows a live feed of a lab in Germany where a Huawei base station is delivering about 70Gbps. Test results vary partly because some trial networks use more spectrum than others. In each case, those speeds would be shared by everyone using the cell. But they're all huge jumps from LTE, which is just reaching 1Gbps in its fastest forms these days. Low latency is another big feature 5G is supposed to have. It's a bit more complicated. Latency is the delay between when a cell sends a bit and a phone receives it, and vice versa. It's going to be more important when things like robots and connected cars get on cell networks. For example, if a remotely controlled robot senses its own surroundings but needs to ask the cloud how to respond to things nearby, it had better get nearly instant responses so it can act on time. LTE isn't built for a quick enough turnaround, no matter how many bits per second it can transmit. The consensus is that 5G should get latency down to 1 millisecond. That's a simple number to remember, but it's also the time it takes for someone to react to an object in front of their eyes, said Professor Gerhard Fettweis of TU Dresden. If a wireless virtual-reality headset can't sync up vision and reaction at least that closely, the user will start to feel sick after a while, Fettweis said at an MWC panel discussion. Deutsche Telekom's T-Mobile is demonstrating that concept on the show floor with a robotic arm. The arm places two metal balls at the top of a small tower, where they're secured by electromagnets. Then the arm swings past the tower, and when it's detected passing underneath, the balls fall. The ball controlled over a network with some 5G features drops in time to be caught, but the one linked to an LTE network falls too late. 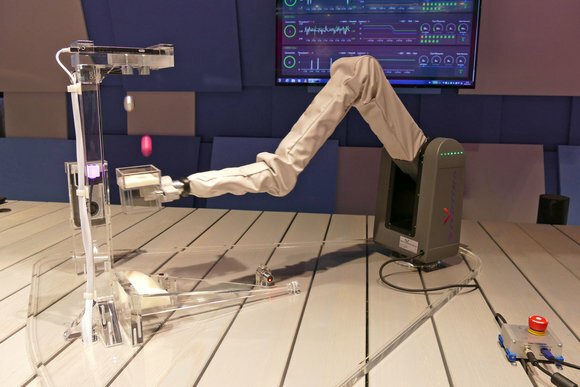 A demonstration of potential 5G technology in the T-Mobile booth at Mobile World Congress 2016, seen on Feb. 24, 2016, used a robot arm to show a benefit of low-latency wireless. 5G is also meant to connect millions of low-power devices like sensors and meters. There won't be much data traversing those links, but the objects at the edge will have to operate for years on the same battery. 5G is expected to go one step further than LTE's emerging low-power system, Narrowband-IoT. NB-IoT can handle about 100,000 devices per cell, 100 times regular LTE's capacity. If IoT proliferates like so many vendors and carriers say it will, there may be a need to support another 100 times as many. 5G will have so many uses that it will need a way for carriers to make the same network perform in different ways for different users. The software that can do this function, called network slicing, is expected to be a key element of 5G. SK Telecom, T-Mobile and others are demonstrating it at MWC. Network slicing divides the infrastructure into several virtual networks optimized for things like high speed, low latency and low power consumption. Each virtual network gets its share of a pool of computing power, and if one gets overloaded, the others aren't affected. Now for the bad news. No one's showing 5G handsets yet. The devices that simulate phones in current trials can be as big as an ice cream cart. And the 10-year IoT battery life everyone's talking about assumes batteries that are reliable for a decade. "The 10-year battery life thing? I'm not aware of a conventional AAA battery that will survive 10 years in a traditional nickel-cadmium shell," said Kenneth Stewart, chief wireless technologist for Intel's Platform Engineering Group. Finally, part of the plan for reaching super-high speeds in 5G is to use frequencies far above anything ever used in cellular. There's a lot of spectrum up there, but regulators around the world first have to agree on how to assign it. That won't happen until the next World Radiocommunication Conference in 2019, putting a damper on hopes for real 5G before 2020, independent mobile analyst Chetan Sharma said. Even after 5G is in commercial use, it'll keep evolving, just as 4G has done. The future's never really finished.